Would you believe it? 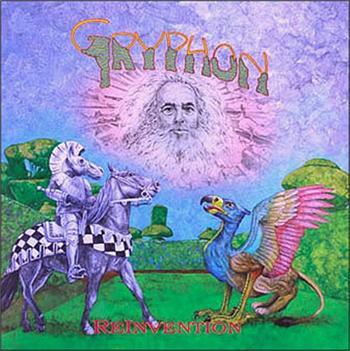 Seventies band GRYPHON are releasing an all-new studio album of especially written, previously unheard material! Coinciding with the 2018 release of Remastered versions of all four 70’s GRYPHON studio albums for Transatlantic Records over one 2CD Set (‘Raindances-Transatlantic Years:73-75’) is ‘Reinvention’, the band’s comeback album, a record that arrives all of 41 years after their 5th album was released, way back in 1977! Now they really are the oldest and the newest thing - a legendary British band that’s as exhilarating, energetic, unpredictable and addictive now as it ever was! No-one could ever pigeonhole GRYPHON. When the first album came out, the band appeared on BBC Radios 1, 2, 3 and 4, all in the same week. They appeared with YES at Madison Square Garden and Houston Astrodome, played Progressive Rock festivals, folk clubs and cathedrals. They wrote and played the music for Sir Peter Hall’s National Theatre production of: ‘The Tempest’ at the Old Vic and found a unique place in the hearts of folkies, Proggers, Early Music aficionados and anyone with an ear for something creative, fresh and different. When they split, the members furthered their experience appearing alongside everyone from Kate Bush to Van Morrison, Cher to McCartney, John Williams to Long John Baldry, but after a one-off sell-out show in 2009 at the Queen Elizabeth Hall in London, the band reformed in 2016 as a six-piece with three new members. Since then, they have been back on the road wowing audiences all over again and rapidly gaining a new fanbase! ‘Reinvention’ returns in part to their early connection with Lewis Carroll’s Alice books, in which they found their name. Guitarist Graeme Taylor has set the White Knight’s song: ‘A-Sitting On A Gate’ into an epic 11-minute extravaganza which takes us on a musical journey from a reflective Brittenesque bassoon, clarinet and violin trio introduction, into a Prog-rocky dialogue between the White Knight (Brian Gulland) and an ‘aged, aged man’ (Dave Oberlé), through a heavy-metal riff with a suddenly distorted and harmonised bassoon, and thence to a plaintively tragi-comic conclusion to bring us home with a rousing military march. Something for all the family! Brian Gulland, as usual, entirely off the wall, provides 4 New Compositions, displaying his wide influences from 20’s English humour, through harrowingly massive church organ chord sequences and haunting New Age recorder, acoustic guitar and vocal moments, through the gamut to some strident and stirring full-on electric rock riffs. Relatively new member (of a mere 9 years’ service!) [legendary violinist] Graham Preskett also contributes 4 new compositions, very much in a mid-70s GRYPHON style, though adding for the first time some Celtic influence, and demonstrating his experience in writing filmic music. Graham is not only invaluable for his writing, but is also a brilliant multi-instrumentalist and employs his talents on violin, mandolin, harmonica and keyboards to great effect. So what is GRYPHON’s music? It’s just as it always was – imaginative, quirky, dazzling yet full of humour. It’s mainly acoustic, featuring a kaleidoscope of instruments. Every gig and album utilises at least forty instruments, so the textures can be pretty varied and unfamiliar. Singer Dave Oberlé provides creative percussion, whilst alongside founder member: Brian Gulland on bassoon and bass crumhorn, the extraordinarily virtuosic Andy Findon shines on clarinets, saxes and flutes. Rory McFarlane supports all this with his solid, sensitive bass, and also donates his original composition: ‘Bathsheba’. GRYPHON, as ever, is the antidote to genres. Whatever you expect, you’ll get something different, surprising, and exciting. Whatever you get, it’ll make you wonder why it took these guys so long to crank up the engines and get back in the studio again, but as ‘Reinvention’ proves, it will certainly be worth the wait. ‘Reinvention’ is released on 1st September 2018.